All 428 Cobra Jet and Super Cobra Jet Mustangs were originally equipped with a Carter "X" fuel pump. 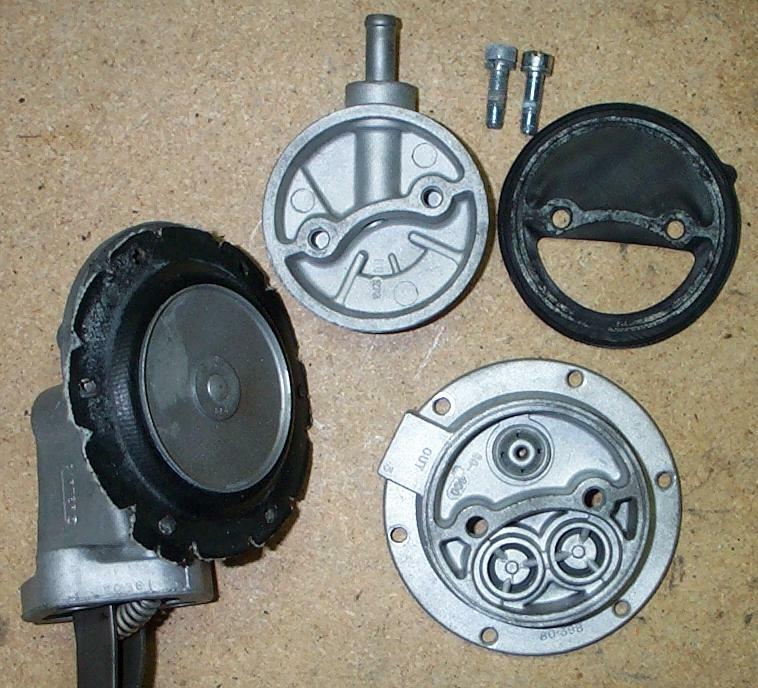 Over time, the rubber diaphragms, seals, and other internal parts within the pump can wear out, making it leak or otherwise perform poorly. 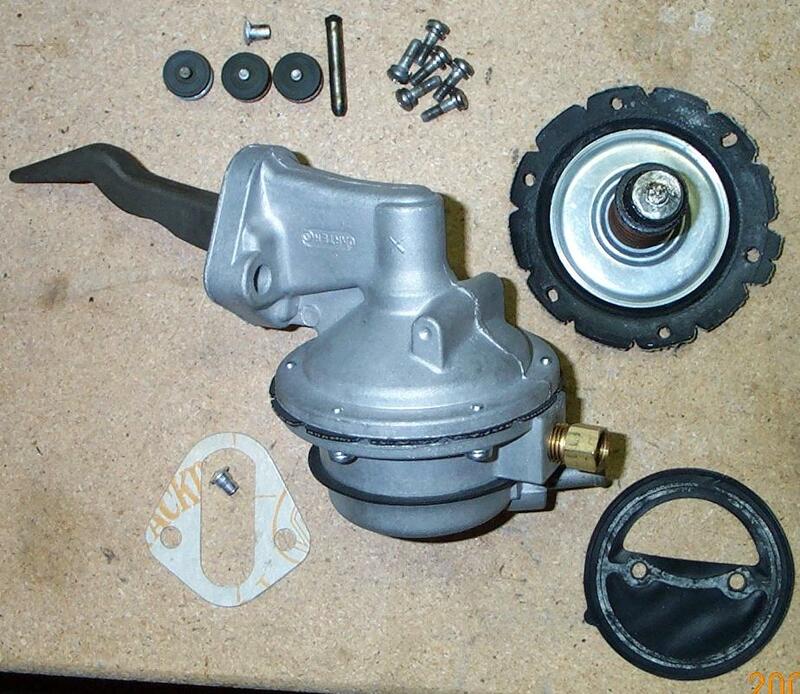 Luckily, many parts vendors sell a kit to rebuild these pumps using common hand tools. 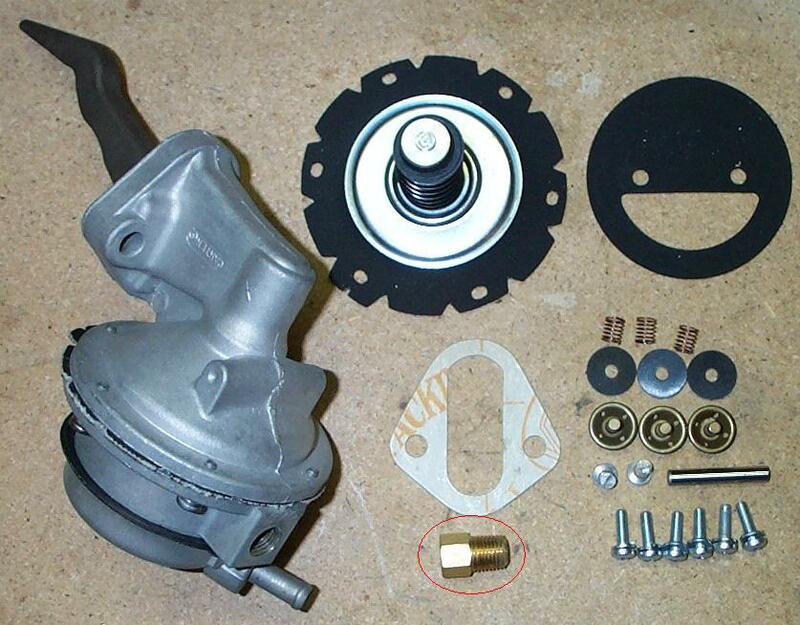 This web page describes how to rebuild a Carter "X" fuel pump using a kit produced by AMK Products along with an output fuel line fitting purchased from Mansfield Mustang. Note that the AMK kit doesn't include the fitting, but the kit available from Mansfield Mustang does. Keep this in mind when shopping around if you happen to need the fitting, because Mansfield Mustang doesn't normally sell the fitting by itself. Stuart Cofer graciously provided the fuel pump, kit, and fitting used to write this article. The pump, kit, and fitting (circled in red) are shown in the picture below. Step 1: Confirm that you have all of the parts needed to complete your rebuild. Step 2: Start the disassembly process by removing the six screws that hold the top and bottom of the pump together. It might help to mark the location of the two halves with a pencil or some other removable marking to help you remember where the two halves fit together. Step 3: Separate the top and bottom halves of the pump. The two screws circled in red get removed next. 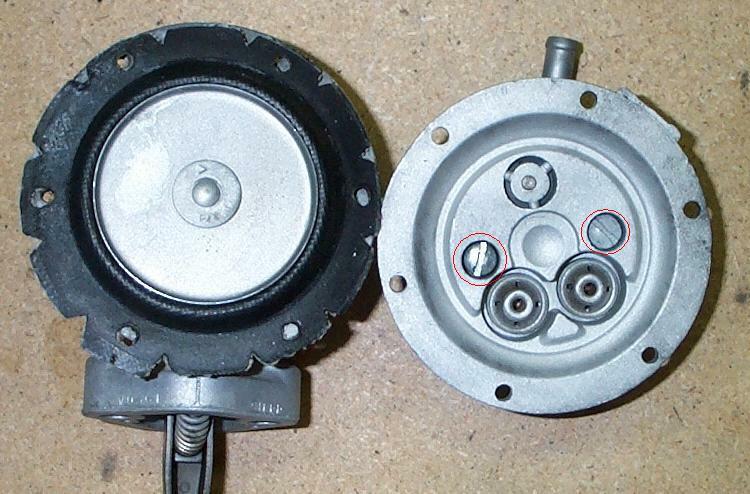 Step 4: Separate the fuel bowl (the bottom half of the pump) by removing the two screws from the upper half of the bowl. Note that these screws can sometimes be VERY difficult to remove if they've corroded at all. Use the largest screw driver you have available to avoid stripping the heads of the screws. If you do end up stripping the heads you'll have your hands full trying to get those screws out, and they're NOT included in the rebuild kit! Step 5: Now turn your attention to the top half of the pump. A bench vise can help hold the top half of the pump. You might need a helper otherwise. 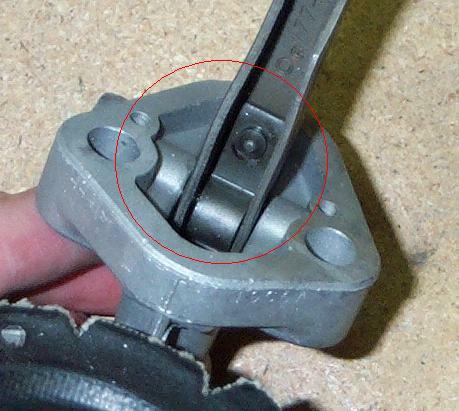 Remove the plug (circled in red) by prying under it gently with the small flat-bladed screw driver. 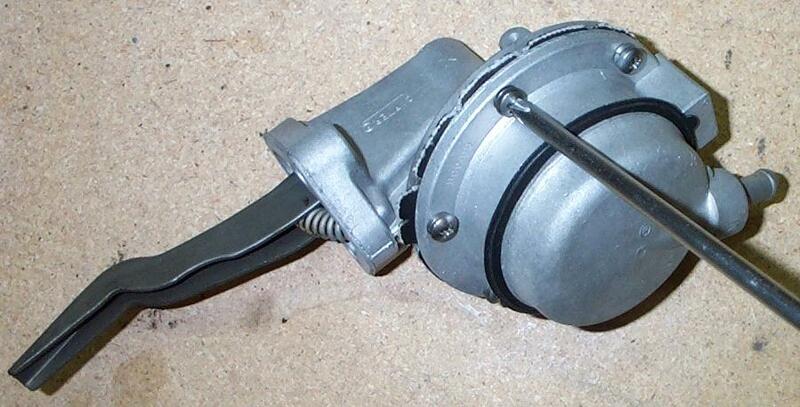 It might help to hammer the screw driver in under the plug; avoid doing any damage to the body of the pump itself. 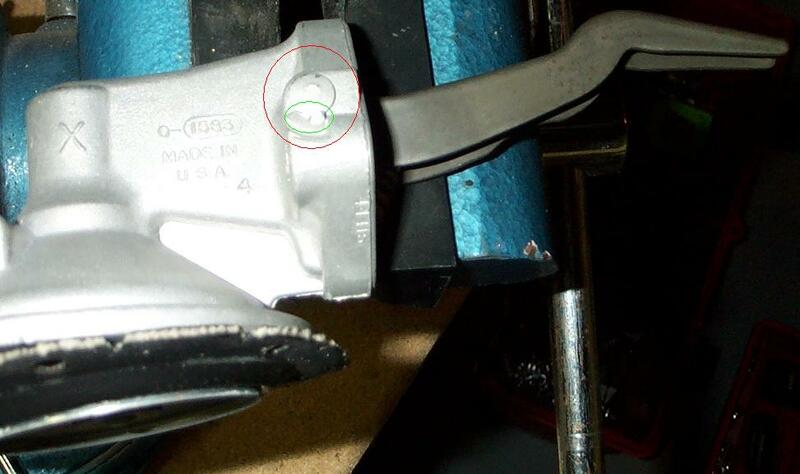 Note that you will most likely break off a small bit of the tab (circled in green) that's staked over the plug. This is normal. Step 6: Remove the spring that fits between the housing and the actuator arm. 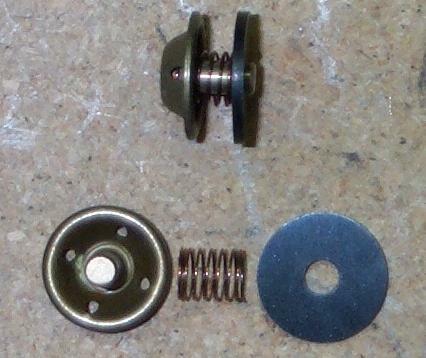 Be careful when removing the spring as this part, too, is NOT included in the rebuild kit! Step 7: Remove the spring perch by lifting it out of the housing. Once it's out of the way you should be able to see the dowel pin that holds the actuator arm in place. Slide the dowel pin out using a pair of needle nose pliers. Once the pin is out you can remove the arm and the large diaphragm. Just pull, the diaphragm should come out with some gentle persuasion. Now is the time to clean all of the parts. Some people like to bead blast and paint the housing. Bead blasting and paint can help if the housing is really dirty or corroded, but be sure to carefully clean out all of the blasting residue. Compressed air or thorough washing should do the trick. I prefer to skip blasting if the housing is in nice shape as this one is. Now that the top half of the pump is disassembled, take a look at the area around the dowel pin hole plug. If the pump has been rebuilt before there's a chance there won't be any tab material left. If your new plug fits snugly you're probably OK without any tab material. If the plug is loose, though, you'll have to figure out a way to keep it in place. It might be worth threading the hole and inserting a threaded plug if you really want to save the pump. Step 8: Back to the bottom half of the pump. Push out the small check valves using the punch and hammer. Be sure to note the direction in which they came out! Assemble the three new valves as shown in the picture. Step 9: Tap the check valves into place using the 7/16" socket. Two valves face upwards, one faces down. Tap them in until the mounting pins are flush with the housing. 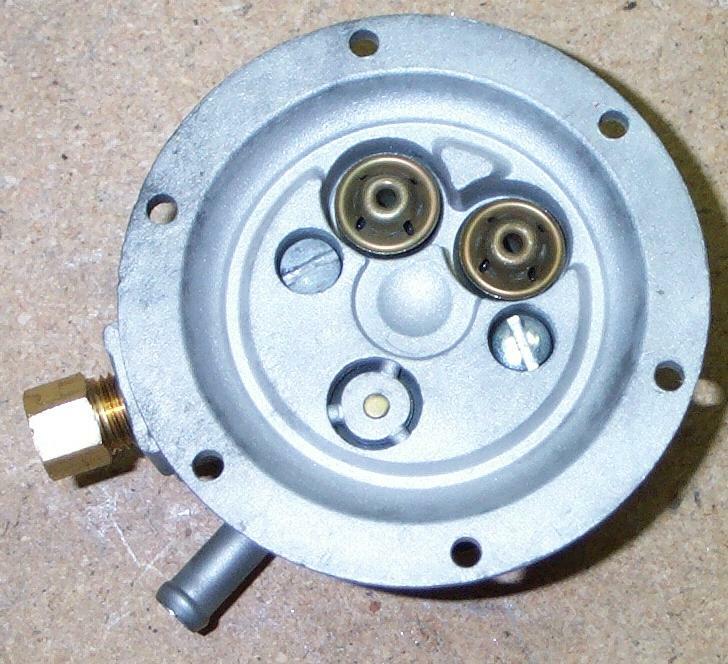 Step 10: Install the new gasket over the bottom half of the fuel bowl as shown in the picture. 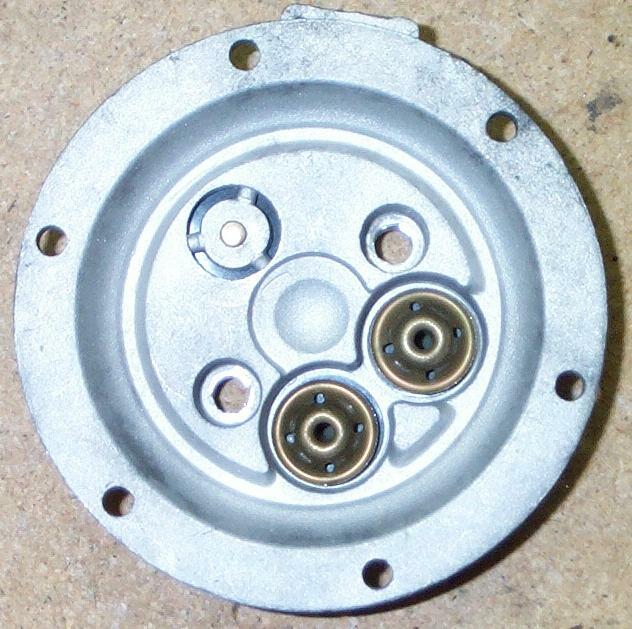 Step 11: Rejoin the two halves of the fuel bowl using the screws you removed in step 4. I like to use a small amount of anti-seize on these screws to help the next guy who might need to rebuild the pump. Install the outlet fitting using the 9/16" socket. 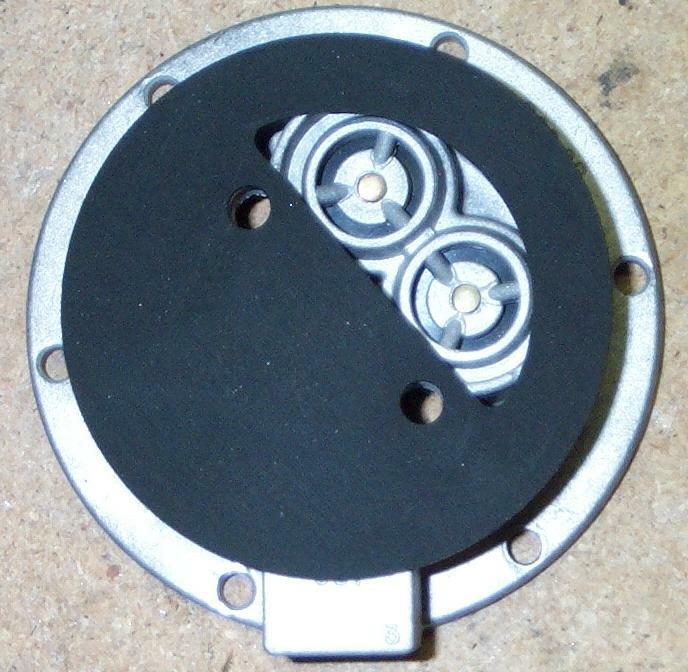 Step 12: Reassemble the top half of the pump by pressing the large diaphragm into the top half of the housing. Place a little bit of white lithium grease on the internal end of the actuator arm. Fit the arm back into the housing so that it's under the rubber washer and above the larger of the two metal washers on the plunger attached to the diaphragm. Be sure to line up the holes in the arm with the holes in the housing. Grease the new pin and install it in the housing to hold the arm in place. Place the assembly back into the vice or call your helper again. 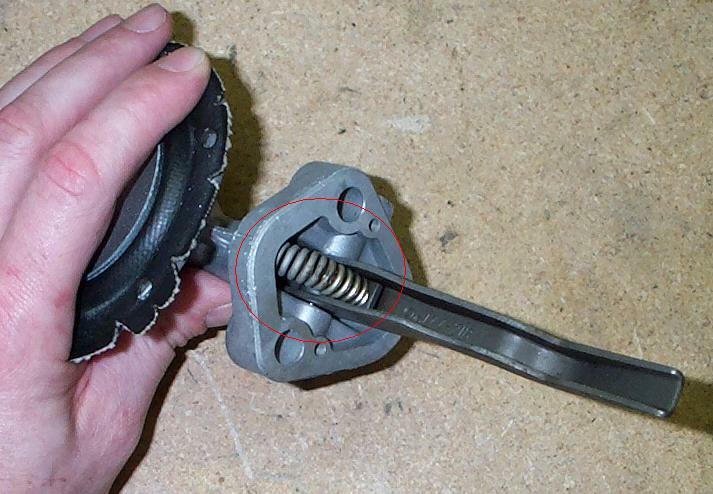 Reinstall the spring retainer and the spring between the housing and the spring retainer. Reinstalling the spring is probably the most difficult part of this process. 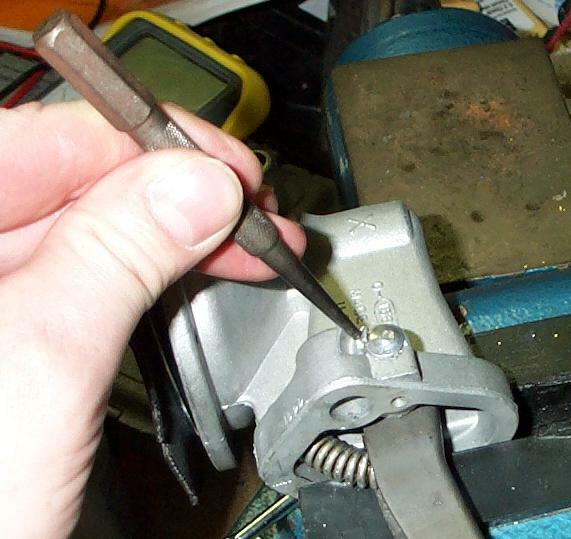 I found it helpful to seat the spring against the housing, then to hold and bend the spring with the needle-nose pliers while using the small flat-bladed screw driver to move the bottom of the spring onto the retainer. It's not easy, so please be patient and careful -- you don't want to lose the spring! Did I say that it's NOT included in the rebuild kits? Tap a new plug into the dowel pin hole. Take your center punch and stake a small amount of the remaining tab over the side of the plug, or secure the plug some other way if you're stuck without tab material. Step 13: Rejoin the two halves of the pump using the six remaining screws and lock washers included in the kit. When finished you'll have a pump that's ready to provide you with several years of trouble-free service. Here's a final shot of the completed pump with the old parts and the remaining parts from the kit. The AMK kit includes two dowel pin hole plugs (we only needed one) and a gasket to mount the pump to the engine block.